but that is what we are now in the process of doing. Unseeable reality is seen just as it is. The first of these statements describes the apparent death wish of industrial civilization, while the second describes the deep meditative experience of a thirteenth century Buddhist master. We in the Ecobuddhism Project understand the present as an historical period of existential and spiritual crisis, when such apparent opposites have something crucial to say to each other. The ?enlightenment? recognized by mainstream Western culture was a cultural shift in the seventeenth century?from religious belief to trust in mechanistic science and secular humanism. Since then we have understood Nature and ourselves to be machine-like. The industrial growth society is a product of that Cartesian worldview. Over the last sixty years, the fetish of limitless economic growth has driven us faster and further than ever before. This is a society that cannot stop to ask sincerely where it is going. At the end of the hottest decade on record, we are surrounded by unprecedented droughts, floods, crop losses and technological accidents. The mainstream media, still peddling ?classical? economics, ignores either climate science or clean energy as legitimate subjects of interest. It fails to join up the dots for people on the most important issue of our time: the survival of life on Earth. Scientific findings and warnings are relentlessly subverted by fossil fuel corporations, who have spent hundreds of millions of dollars to manufacture doubt about global warming, distort the democratic process and safeguard the very energy infrastructure that caused the crisis. It is beginning to look as if western enlightenment has run its course?that it will fail to prevent the collapse of civilization. In the 20th century the Western world became aware of another type of enlightenment, the ?great awakening? of the Buddha. Starting with one person, its sustainability became evident in methods of training, wisdom and trans-cultural influence that have endured for 2500 years. Many men and women across a variety of cultures have used this path and experienced their own awakening. Might they be able to help us overcome our collective malaise in the face of ecological chaos? The Buddha had a deeply-felt understanding of limits. Happiness, he found, isn?t gained by trying to satisfy all our desires. In fact, a minimalist approach to possessions positively enhances long-term contentment. Meditation can sustain the process of personal transformation. The practitioner uncovers a deep interdependence between the self, the other and the context. 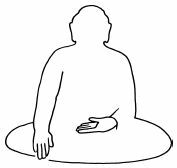 The Buddha developed a culture of awakening from self-centered conditioning. But we are living in the midst of social-engineering technologies that persuade us to base our identity on consumption. My consumer-self is dogged by dissatisfaction, so I spend more and more to resolve the conditioned anxiety. And I will resist the truth of ecological crisis, because consumption has compelling psychological meaning for me. If Buddhist meditation is to have comprehensive relevance now, it must be able to cut through such social conditioning. And that must take place in a context that is vastly different from the Indian Bronze Age, when the Buddha first set forth his noble path to awakening. If I hold beliefs that conflict with each other, I will experience ?cognitive dissonance? ?a subliminal anxiety resulting from inconsistency. I could try to eliminate this by changing one of the beliefs. I might resort to denial, or find someone else to blame. If my meditation can?t show up these dysfunctional habits of mind for what they are, it could create what Joanna Macy calls ?premature equanimity?. But the great windstorms, fires, droughts, floods and snowstorms of the last decade will not cease to impose a radically new world on us. This is why the eminent Zen teacher Thich Nhat Hanh says: ?Every Buddhist practitioner should be a protector of the environment. We have the power to decide the destiny of our planet. If we awaken to our true situation, there will be a change in our collective consciousness.? Resource depletion, ecological disasters, over-population and climate chaos are indicators of spiritual as well as ecological collapse. They demonstrate also how much we need a story that renews our love for the mystery of the Earth?a story that can integrate the world?s wisdom traditions with the sciences of cosmology and evolution. Thomas Berry pointed out that the Universe itself is our new sacred story. Everything in the Universe had a common origin in the mysterious Big Bang some 13.7 billion years ago. We ourselves are participants in its awesome physical and spiritual dimensions, which are an authentic source of joy, celebration and support. Undoubtedly there is a profound challenge to self-realization in the midst of ecological crisis. The process may require us to pass through what Macy calls ?uncertainty and positive disintegration? ?experiences that stretch, ground and strengthen meditation. If, on all levels, we look ?again and again at that which cannot be looked at?, we can nourish our capacity to respond fearlessly and appropriately to the big picture. We can take refuge in the Sacred Universe process. John Stanley is a Buddhist scientist who edits & maintains the website Ecological Buddhism (www.ecobuddhism.org), where Zen Buddhist teacher & author David Loy is a board member & advisor. They co-edited the book A Buddhist Response to the Climate Emergency (2009).